Whether you’re visiting Rome at Valentine’s Day or taking a romantic city break with your loved one, The Roman Foodie has you covered. Knowing Rome like the back of your hand means knowing the right places to eat when you want specific food. So, if it’s romance you want, then continue reading our list of the Top 5 Romantic Restaurants in Rome. The walk up to the restaurant is romantic in it’s own way so we’d suggest getting there by foot if you can, but otherwise you can ask the taxi to drop you off at Piazza Garibaldi. As you climb up through the park on the hill behind Trastevere, you’ll realize why the walk was worth it. At the very top you’ll be confronted with the best panoramic view over the Rome. You can see everything form the Colosseum to the Spanish Steps! This is the perfect place to sneak that little bottle of prosecco out of your bag before after dinner. You can then enjoy the sunset over Rome and see it glow under a starry sky. Just round the corner at the top of the hill, you’ll find the coziest restaurant on the hill. A top location and gorgeous food – your partner will be well impressed with your effort! But just wait until you open the menu before you allow them to start drooling (we highly recommend the risotto). This is fine dining at its best. Expect pristine white linen dining tables, excellent service and high-quality food. Across the river from the hustle and bustle of the city, it proves a quiet and tranquil place to escape the crowds. This gives you the perfect romantic night in Rome that you’ve been looking forward to. This is as good as it gets in terms if you’re looking to enjoy a meal on a rooftop in one of the top 5 romantic restaurants in Rome. This restaurant is of superior quality, boasting a creative and diverse selection of both international and Italian food. With an unforgettable drinks menu too, this is indeed top dining for sure. Come here at around 7:30pm for the best time of day to enjoy the view over the Roman Forum with a glass of prosecco in hand. With an incredible view of the Roman ruins, it is a backdrop for one of the most romantic scenes in the city for sure. Any partner or potential loved one will be incredibly moved. Catering to all types of foodies, from fish-lovers to vegetarians, you’ll get a great array of fancy cuisine at this rooftop restaurant in Rome. This place just oozes romance, soppy love stories and intimate candlelit dinners. With only six tables in the restaurant, this hotspot is the perfect place for a cozy meal with a loved one or even a first date (if you want to show off). The setting is gorgeous with perfectly laid out tables and even torches to look at your menu as the romantic lighting is dimmed to perfection. Something extra special about this place is the entertainment. You can expect a singing lady at your table whilst you wine and dine! Now if that doesn’t scream romantic Italy then what does!? The food is magnificent, with top reviews. The hot dishes of the place are the truffle pasta and the superb and perfectly rich-but-not-too-rich chocolate mousse. With excellent sharing dishes too, this place is definitely ideal to set the romantic mood. It’s central location makes it ideal for those after-dinner midnight strolls in the city. We do prefer the city at nighttime, with the perfect lighting making the capital’s monuments look even more spectacular. You can easily stroll around to Piazza Navona, the Pantheon or the Trevi Fountain after dinner just to put the cherry on top your romantic meal. Although this place is still quite pricy, it is one of the cheapest on our list and not only one of the top 5 romantic restaurants in Rome but also one of our favorite in the city in general! So if you need to woo that special one, this is a special place to take them. Enjoy. This place is a different type of romantic. There are no rooftop views, no candlelit dinners nor jazz music by any means. HOWEVER, it serves a perfect Italian pizza – and that makes it qualify for our list of top 5 romantic restaurants in Rome and a good place to take a date. The thinnest, most perfect base – this is classic pizza at its very best. The style of the restaurant is far from Michelin and don’t expect the pristine tablecloths. Instead, the restaurant’s actually decorated with paper place mats which that ripaway after each diner leaves. There are no leather-bound menus, but a check-list menu where you tick off what you would like to order. It’s so alternative, there isn’t even an official website! You may be thinking, why is this place on this list? Well, apart form the pizza, it’s the atmosphere. The buzz really makes you feel like you are in the hub of Italian foodie culture. Your date will be raving about the food, and the crammed (or you could say intimate) setting will have you winning. Any pizza here is outstanding, but anything with buffalo mozzarella is a keen favorite of ours. You can’t make reservations unfortunately, but this just adds to its rustic and local charm. What’s more, you can enjoy a drink outside while you wait to order your food – score! This place is rather expensive, but well worth every penny. We’re talking fine FINE dining in an amazing historical place. The historical residence owned by the Fendi family was built in 1911 and is located in the area of Prati, which is nestled beside the Vatican state. This means it is rich in history and culture. It is the area that hosted the exhibition that celebrated the 50th anniversary of the Kingdom of Italy in 1911. The villa was transformed into a hotel and then came the mighty restaurant. The place boasts everything – spectacular history, amazing architecture, panoramic views and good food – all perfect for that special someone. To quote the restaurant, ‘to feel good. That’s what we want for our guests: we want them to feel good’ – yes please! How could you not feel good whilst looking at their menu? From beef tartre with smoked foie gras, lamb of Tuscia, saffron rice and the interesting choice of anchovy ice-cream, this place just has it all. It ticks all the boxes and we love every minute of it. Interestingly, shorts and sandals are not allowed at the restaurant, keep it classy for this place. There is even an online booking system for this joint, that for Rome you might say is very, very fancy. Found anything interesting on our top 5 romantic restaurants in Rome list? What about eating in one specific area in Rome? Another good food spot in another historical area? What about eating near its most iconic monument? 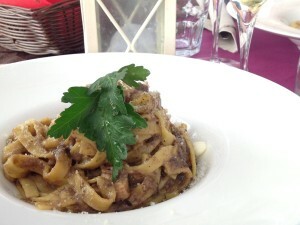 Have you seen our post on Top Restaurants to Eat near the Colosseum. Many say that the best Italian cooking is done at home. Mainly with mamma (mom) or nonna (granny). Spending a romantic evening in an alternative way, you can learn about the greatest Italian food from the very best! Book onto one of our Rome Tours & experiences with a Local Food Tour in Rome. So there you have it. The Roman Foodie‘s Top 5 Romantic Restaurants in Rome and everything in between. You won’t need your chat-up lines and small talk for your date with these stunning locations. The places and food speak for themselves. You can thank us later. From your good old friend, Cupid.